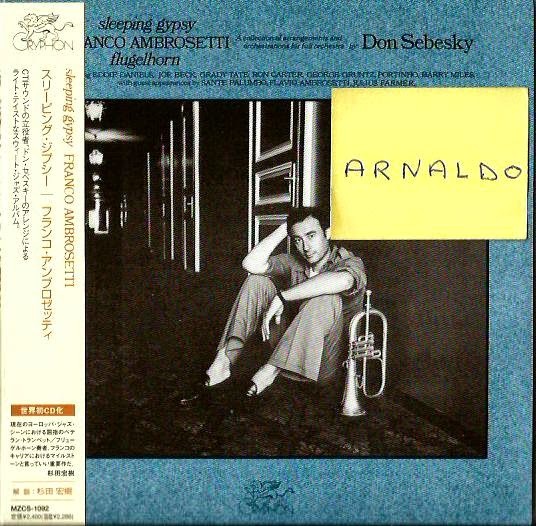 Jazz Station - Arnaldo DeSouteiro's Blog (Jazz, Bossa & Beyond): CD Reissue of the Month - "Franco Ambrosetti & Don Sebesky: Sleeping Gypsy"
CD Reissue of the Month - "Franco Ambrosetti & Don Sebesky: Sleeping Gypsy"
Ambrosetti's best solo album ever. At the height of his powers, the Swiss trumpetist shows why he is one of the top all-time flugelhorn players, alongside Clark Terry, Art Farmer, Freddie Hubbard and Chuck Mangione. Don Sebesky provides sumptuous scores in the lush CTI style, and contributes with two original tunes: the haunting title track "Sleeping Gypsy" (the guitar intro recalls the Jay Berliner performance on "For Someone I Love," from the Sebesky-arranged Milt Jackson's "Sunflower" album) and the fusion-oriented "Lugano Lady." Also this Wednesday, Yuko Ito @ Kitano! TBT, "Fantasy 20-Bit Digipack Series"